Pandoro and Panettone. It's a Process. To Heaven. Since the Pandoro and the Panettone arrived in our warehouse, a week ago, and we tasted them (it’s called Quality Control, and we are very good at it), we felt the urge to call Luigi Biasetto, the master pastry chef who makes them in Padova. We talked to him today. Luigi, did you perhaps do something different, this year? 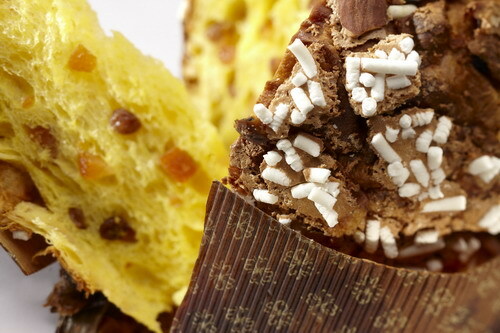 The Panettone and the Pandoro taste even better than last year’s!!! We were not on a video call but we could clearly sense he was smiling. It was also very clear he was very happy that we noticed. YES!, he said, baking is an art and my baking is always in evolution. Every year I try to do something different. This year he used a butter that was not “centrifugato” but “affiorato”, which gives the cakes a less fatty and lighter taste and texture. Also, and not less important, he used a different honey. This year, he used a rare “ivy honey”, from an organic farm in Tuscany. The ivy honey has a high concentration of glucosio (less sugar in the cake) and it has a grassy, cinnamon flavor. The peculiarity of this honey is that it crystallizes quickly, Luigi Biasetto said. And therefore, this year more than ever, in order to taste the Panettone and the Pandoro at their heavenly state, you should warm them up for a few seconds in the microwave or in the oven. Grazie Luigi! Previous Post Made in Italy? Who are we kidding? Next Post Never Use This!